Vasar Ltd. work environment policy is based on the duty to manage the production and provision of services in accordance with safety requirements. Employees are the most important resource of the company and consequently, Vasar Ltd. is engaged in the continuous improvement of the workplace. 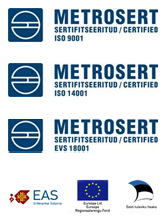 Vasar Ltd. holds EVS 18001:2007 (OHSAS 18001) certificate of Health and Safety Management System standard.